Everyone has their own view of the world based on the experiences, surroundings, cultural influences, education, upbringing, family life, work life, love life and any other conditions that they have been exposed to. So in that sense there are as many views of the world as there are people walking it. Nevertheless there are a number of commonly shared sentiments that the great majority of people share about this world. This can hardly be called a coincidence, coincidence is in fact an illusion. Intention is not, neither is cause and effect. A majority of adults in most countries have lost their faith in politics and what meaningful things politicians can do for them, the sentiment towards bankers and officials in high places is not much better. Just check the polls and research, just ask a bunch of people in the vicinity of where you live, there is deepfelt disappointment, desperation, apathy and anger about the living standards, security and quality of life in general. Also the predominant atmosphere seems to be one of every man for himself and God for us all, the survival of the fittest and most cunning, too bad for the rest of us. But that is not the kind of world most people would like to have, so how come it is this way despite all the good intentions? I come to that in the next page, please read the below first though. The ignorance of humans becomes obvious when one takes a look at the completely diverging and conflicting beliefs and convictions that they hold. What makes it worse is that often neither of the persons holding conflicting beliefs is willing to admit that they might possibly be mistaking. The point is that if we all would know all there is to know, there wouldn't be any need for beliefs and only facts would remain. Facts cannot be disputed, they are just the facts. 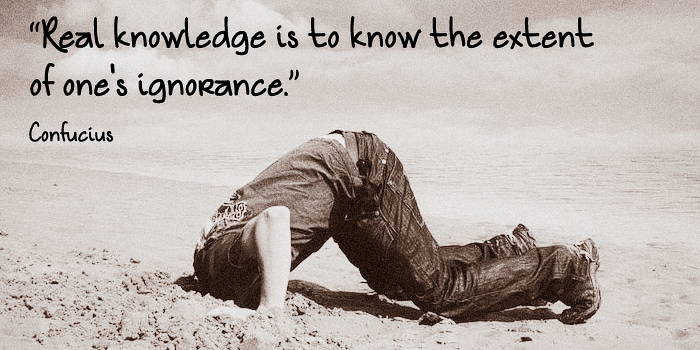 So it is no use to condemn ignorance, but it is of the highest priority to provide truthful information as well as reconnect people with their own inner knowing. Opinions are overrated, especially in the so called free democracies of the West, for various reasons. First of all, many opinions are partly based on ignorance, people often don't know all the facts about the subject they have an opinion on. Secondly, opinions are usually colored by personal preferences and tastes as well as the fashion and customs of the time and place. Thirdly, opinions tend to be used for overbidding others, from the notion that one standpoint or perspective is more valid or relevant than another. On top of that, free democracies don't really exist on this planet, so that puts freedom of speech on another level of appreciation. Try to have a spontaneous manifestation or demonstration or climb on a chair in a busy street in a major city and address the population to tell them what's going on behind the scenes, and there's a good chance you will be arrested for flocking together and disturbing the public order. True freedom is of an entirely different nature, it means expressing yourself fully from the depth of your soul at all times without necessity to consider the reactions, it also means all people taking full responsibility for all their actions at all times so that nobody needs to worry about being harmed in any way. And it means having left behind all attachments, judgements and need to possess or control. Human beings are creatures of habit, and most don't realize that they can always change any decision that they ever made about themselves and their lives, including the most basic and fundamental ones. Additionally, human beings and especially children can be very easily manipulated and controlled in a multitude of ways. Being aware of that is the first step on the way to freedom. Major imbalances in the world. Culture versus nature - Mankind has cultivated land for ages, has built infrastructures, buildings, created fields for growing food crops, playing sports and providing recreation, and in the process has swallowed up much land that was once the domain of wild plants and animals; in populous areas nature has been relegated to small pieces and strips of land where no complete ecosystem can exist anymore, and in more sparsely populated areas commercial enterprises and corporations keep making their moves to extract anything of value from nature, such as wood, natural oil and gas, precious metals, minerals etc. thereby disturbing the soil, clean surface water, rest for animals, biodiversity and coherence of the local ecosystems. Unlimited exploitation and destruction of nature for whatever reason must therefore be stopped at all cost. Mind versus feeling - Similarly as culture and nature are outward expressions of life, mind and feeling are inward expressions where mind mirrors culture and feeling mirrors nature. Both are equally valuable as aides and tools of manifestation. In all widespread civilizations on Earth there is a strong emphasis on the mind, the idea is that it can accomplish what feelings cannot. That is actually true, but the opposite is also true, feelings can accomplish what the mind cannot if it is only allowed the opportunity. The mind tells us to pursue material gain, follow rules that are set and do what is expected of us, feelings tell us to pursue spiritual development, become a better version of ourselves and be truly free. The old natural civilizations once abundant and thriving that knew how to live in balance with itself and the environment have all been decimated, displaced and/or assimilated by the now dominant ones. We should rediscover the richness of these nearly forgotten civilizations. Male versus female - The masculine qualities (clarity, strength, determination, functionality, straightforwardness, protection, sovereignty) are of a much different character than the feminine qualities (mystery, compassion, care, nurturing, creativity, sensuality, connection). Wisdom can only flourish in the balance of the two. In our patriarchal societies the center of gravity is in the masculine qualities, which ultimately results in a harsh, unforgiving environment that abandons the essence of what makes us human. We don't need to switch back to a matriarchal society ruled by women as apparently existed until some 5000 years ago, but it is of extreme importance to find the middle of the road again. Effort versus reward - This can also be termed Giving and receiving. In the world of today many people have to make great efforts just to survive, to secure the means that can satisfy their most basic needs. They need to do that on a daily basis and it has become their routine. Other people get ample reward while it isn't necessarily clear what efforts they make and what contribution to society they provide. The richest people on Earth are those who have mastered the art of taking advantage of as many other people's efforts as possible. This is clearly causing a grave imbalance in access to and ownership of resources, which can only be solved by a redistribution of wealth worldwide and the abolition of the mechanisms and methods of exploitation and profiteering. Power versus serving - Power in the understanding of many people is synonymous with taking decisions for others and making others do what you want them to do. In that paradigm the ones that don't have the power are serving those who are in power. This can be represented by the pyramid shape, where the pinnacle of the pyramid corresponds with the positions of power. The energy flows from the bottom of the pyramid upward towards the top and is concentrated above the tip of the pyramid. It is essential to understand this, as I will explain further on. In a holistic paradigm the pyramid is upside down, meaning the power is in the hands of the masses and the leaders support and serve the people and guide the way that has been chosen by the masses. In such a setting the leaders must be strong and caring, as they need to carry the weight of the pyramid, keep it balanced and feed it with the energy of their inspiration, visions and motivation. In turn the people need to be willing and cooperative to accept the guidance given by the leaders. Supply versus demand - Supply and demand are words that are used primarily in business and economic analyses and theories, but the meaning can be expanded to any field of human activity. It's natural that people have desires and it's natural that people have skills and talents that can be put to use for fulfilling one's own and other's desires. The predominant economic practice, especially in the Western world, is to intentionally create desire and hunger for certain products that are then offered at a premium for the profit of the party offering the product. In times of economic downturn it is often said that there is not enough work. Upon closer examination, it always turns out that there is plenty of work to be done, only there is not enough money to pay for the work that should be done. The same can be seen with just about any other thing that is valued by people, there always seems to be a mismatch between what is available and what is needed. It is the strategy of many corporations to never fully meet the need of people and satisfy their desire, as that would spoil the market. In a holistic and balanced society there is no artificial need or hunger created for anything, the focus is instead on fulfilling the natural needs and desires of all. Wealth versus wellbeing - Wealth is about the material success in life, wellbeing about the immaterial success. Although there can definitely be a correlation between the two, the nature of the two is quite different. Many people tend to think that once a reasonable level of wealth and financial independence can be achieved, the sense of wellbeing will automatically follow. Many people however who did indeed achieve a wealthy status found out that it doesn't necessarily lead to a high level of wellbeing. What is much more important for feeling well and being happy is feeling connected, feeling appreciated for who you are, being cared for and being able and allowed to express your true inner self. On a deeper level all these imbalances and others such as overpopulation (births vs deaths), pollution (output vs input), depletion of resources (consumption vs replenishment), soil erosion (weathering vs shielding) etc. 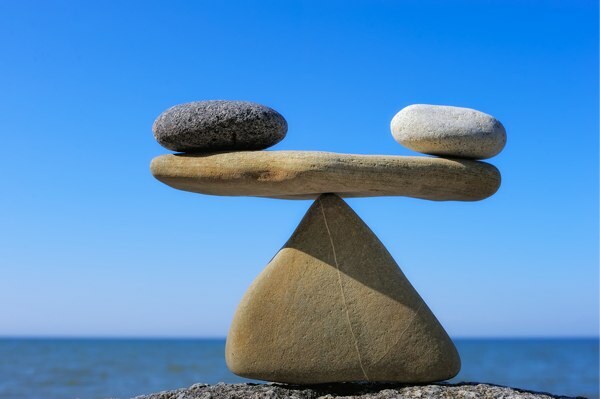 are interrelated and one imbalance leads to yet another imbalance. 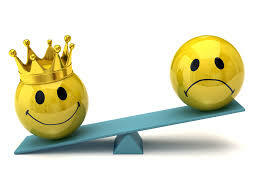 That means that bringing one aspect back into balance will have a positive effect on other imbalances as well. Selfishness can manifest in a multitude of ways, such as for instance corruption, fraud, slavery, overexploitation and crime, but it can also take the shape of more socially accepted phenomena such as profit maximization, market share maximization, brain drain, exclusiveness and sports competitions. While the earlier mentioned selfish practices are condemned by many people due to the obvious damage they do to society and human values, the latter selfish practices are more often than not recommended and advertised as good behaviour. But in the core they are just as selfish and just as detrimental to the texture of society and the sense of unity among people as the earlier mentioned type of practices. The meaning of profit maximization is ultimately taking as much as you can and giving as little as possible in return; this clearly causes an imbalance, which brings us to conclude that imbalance and selfishness are closely related. The reason why people display selfish behaviour and make choices out of selfishness is because they regard themselves as separate from others, an individual with a fixed demarcation line of what is them and what is outside them. This conception is enforced as people experience each other's acts of selfishness, thus confirming the notion of separation from others. This idea that we are all separate entities, beings left on our own to sort things out for ourselves is however not corresponding to the deeper truth of reality. All of life is interconnected on a myriad of levels, we all originate from the one and same Source and we are all destined to eventually return to that one Source. This is completely inevitable and undeniable. What does this mean for us? It means we have the same basic nature and potential, although we differ wildly in consciousness, knowledge, experience and spiritual development. Furthermore it means we can feel what others feel, read what others think, communicate beyond the boundaries of the physical world and put things in motion by our intentions if we only allow it. And lastly it means that our essence cannot be destroyed in any way, we are immortal spiritual beings. To summarize, we behave selfishly as a result of having forgotten and denied our true nature, which must be the worst form of ignorance. That ties together ignorance and selfishness, as all is connected. The cure for selfishness is reconnecting to our spirit, the divine spark within us, and feeling the joy of being a unique part of the huge whole which is life, to which we may and will contribute our own unique flavor from now to infinity. No one contribution in itself is less or more valuable than another, they are just different. No person in itself is less or more valuable than another, we are just different. The key word is inclusion, as we are all part of the key to paradise. The world as it's not commonly known. Okay, are you ready for it? Fasten your seatbelts please, as here I am sharing insights that can really shake your view on life and this world. Humankind didn't descend from apes, but from extraterrestrial humans who came to Earth in the distant past. In general, any species of animal or intelligent being doesn't change much genetically unless there is large scale interbreeding between varying species that can produce fertile offspring or genetic manipulation performed by intelligent beings. The theory of evolution on the origin of species by Charles Darwin is largely false. Physical lifeforms didn't come about by accident or as a result of some coincidental mutation of primordial substances, but by conscious design of powerful spiritual beings acting in accordance with the will of Source. The idea that so called simple lifeforms can originate by chance simply doesn't have the slightest basis in reality. Our life essence or soul reincarnates time and time again after the death of our body in a new vessel which is a newborn baby. Many people can recollect vivid memories and striking details of past lives when going under hypnosis and this has provided ample proof that reincarnation is real. In the distant past highly developed antediluvian civilizations existed on Earth, such as Atlantis and Lemuria, which were at a certain point suffering from serious imbalances just as our current dominant civilizations and which eventually caused their own and each other's thorough destruction. People who do life regression under hypnosis and go back far enough in time can end up in lives they lived in these ancient civilizations and they tell stories that match. Survivors from these ancient civilizations still live today in deep underground cities and caverns, and part of these groups are in contact with each other. This is known as the Agartha network and consists of societies that are highly developed both technologically and spiritually. The universe is teeming with intelligent lifeforms, of which humanoids are just one group that has much variety in sizes, skin colors and shapes. Humanoids colonized many inhabitable planets in the Milky Way galaxy and are the most numerous group of intelligent species within the Milky Way. In the past very large humanoids lived on Earth along with our own kind, they are mentioned in the Bible as the giants of days. Average life span of humans in the far past was longer than today, contrary to what we have learned at school. This is in part because our genes were different and allowed much longer life spans, and in part it was caused by the more favorable and gentle energies on the planet. The Earth's vibration used to be much higher and the planet was less dense. Originally Earth was a 5 dimensional planet with a more fluid and flexible reality. Apart from the many physical lifeforms, there are also many types of non-physical beings in existence, some very powerful and intelligent such as the archangels, others simple and basic such as elementals. They can move great distances with the speed of a thought, but when on an assignment they will stick to a certain place for a prolonged period of time. The physical universe was created with a set of rules, the most important being free will and unlimited potential. Evil came about as a quantum mutation that resulted from the undetermined outcome randomness built into the creation. It was never an intended phenomenon, but came into existence by chance. There is no higher purpose to suffering of any kind, it is not aligned with the will of Source. Due to the rules by which the universe was created however it is not possible to eliminate evil and suffering instantaneously, it has to be transformed and triangulated. A number of archangels turned to evil, ostensibly from a combination of necessity and free choice, and became the fallen angels. They created a dark empire which spanned a large sector of the Milky Way galaxy as well as a few neighbouring galaxies. This empire has been contained by the forces working in line with Source, and has relatively recently surrendered to the Light. This is known as the Treaty of Anchara. Some factions within the dark empire however didn't agree to the surrender and retreated first to Rigel star system in the Orion constellation and later to Sol star system (that's our home indeed). A special dark energy portal for their entry into Earth was created by the Ruanda genocide of 1994. Planet Earth remains the last stronghold of the dark forces in the entire universe and they are not permitted to leave until they surrender or can be forced to surrender. Since some 30,000 years ago when evil first came to Earth, the dark entities have gradually taken over power and isolated planet Earth from the universe by means of very advanced technologies, so that all life on Earth is trapped here and cannot leave. Equally beings from other planets couldn't visit Earth unless they had permission from the dark entities. This is known as the quarantine status or prison planet. For a certain period when the dark empire was being defeated and no party had full control of the space around planet Earth, the planet was being used as a dumping ground for unwanted souls. These include incurable serial killers, rapists, pathological liars and swindlers but also brilliant musicians and scientists who were deemed useless in the worlds where they came from, music being considered unnecessary and economically improductive and all possible scientific discoveries being completed. More on the dark forces occupying planet Earth you can read on the next page, but first the below. A primitive versus a highly developed world. Many people will first think of technology when reading the words primitive and highly developed, but I am referring to the level of spiritual development and awareness. It can be argued that the latter is more important, because life in a technologically simple but peaceful, harmonious and cooperative society is much preferrable over life in a technologically advanced but chaotic, crime ridden and hostile society. In a primitive world many forces are working against each other, there is much disagreement and inability to resolve differences of interest and opinion, the strong defeat the weak, people are being misled by false prophets and corrupt leaders, are out of touch with themselves and each other, tend to listen to each other in a shallow way and draw premature conclusions, principles and morals are sold to the highest bidder and people strive to exclude others from the things of value so that they can have exclusivity and feel special. People who are very successfull receive lots of awards, benefits and attention, while the majority has to fend for themselves and is surviving instead of really living. Many have a habit to leave a mess behind where they go to be cleaned up by others, both literally and figuratively. In a primitive world systems, institutions and beliefs are often considered more important and are better protected than people, problems are being allowed to fester and eat away at society, people disregard each other's feelings, have hidden agendas and talk behind each other's back, adults who cannot properly take care of themselves are nevertheless allowed to have children, animals are locked up in cages, aquariums and zoos for the entertainment of humans and many people want to be like and even look like famous people who they regard as their heros. In an advanced world cooperation is the norm, the focus is on what connects people and cultures and how they can enrich and inspire each other, the strong help the weak, people accept only messages and leadership from truthful and sincere persons and reserve time to go within and meditate as well as connect with others in meaningful ways, always seek to listen to each other on a deeper level and understand where the other is coming from, love rules over money or any other lower manifestation and people strive to include everyone in the banquet of life and its fruits of reward. People who are very successful serve as examples for others and participate in programs that help others to also become successful in life. It is the custom to clean up your own mess and rectify your own mistakes, if you couldn't avoid creating a mess and making mistakes in the first place. In a highly developed world people always come first, above any construct, and systems and institutions exist to make people's lives easier and more pleasant. Problems are being dealt with head on in an early stage and not allowed to grow out of control, people mind each other's feelings and seek harmony, clarity and purity in their communication, it is made sure that every child that is born receives all the care, love, support and attention that it needs to grow up in a healthy way, animals are treated with respect and regarded as incarnated souls just like humans, and people allow and encourage themselves and all others to live up to their full potential and aspirations while maintaining their own unique self. Now you tell me what kind of world we live in? The key distinction between a primitive and an advanced society is what people value more, being right (read outsmarting others) or being kind to others and showing understanding. That being said, the world is not black and white, there are plenty good people with noble goals around, and many who are serving evil would make a different choice if circumstances were different. Ultimately we are all responsible for the situation and life conditions on the planet, and we can all do things to improve it. We have politicians who are supposed to represent us, the people, but betray us instead of looking after our best interests. 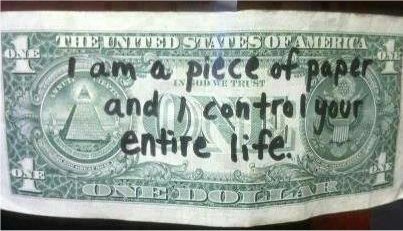 Money was supposedly invented to make barter and exchange of goods and services easier and accessible for all, but it has instead enabled greedy and power hungry people to control and dominate trade and commerce. The media who should inform us, teach us and show us good examples to uplift us, instead tell lies and distorted versions of the truth, show the banal and mundane and offer a platform for the vulgar. Love is measured by how much kind words, compliments, affirmations, nice gestures, gifts, joy and pleasurable experiences one gets instead of how much one gives. Fame is being chased after for the sake of fame and the benefits it brings instead of utilizing it for a worthwile purpose. People who make the most noise usually have the least intelligence and least things of genuine interest for others to communicate. Status is derived from how much you achieved and how much possessions you gathered instead of who you are and what you helped change for the better. The least developed individuals tell others how they should live and what behaviour is acceptable or not instead of listening to and learning from more developed persons. The work that is most crucial for society to function smoothly and fulfill the most basic needs is least appreciated and rewarded. Medicins provided by the pharmaceutical industry are most of the time superficially treating the effects of a disease instead of eliminating and curing the causes of the disease. Fortune seekers leave their life and family behind and come to Western countries just to earn money, but have no connection whatsoever with the place they come to live in. Do you want me to go on? I think the message that I'm seeking to bring across is clear by now; if not, well... read on, brother or sister, or else you can always get back in line with the mass of people that generally do what those interested in manipulating and expoiting us want you to do.